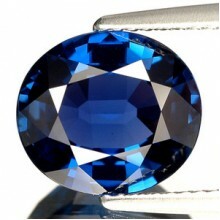 Blue Sapphire (Neelam) is gemstone for Saturn. Saturn is the most effective planet among all planets in solar system, and it is considered most important as per astrology for its fast effect in extreme bad time of saade-saati (Saturn period). The gemstone is best for people of Capricorn zodiac sign (Makar Rashi) and Aquarius (Kumbha Rashi). Apart from that, anyone who wants to reduce the negative effects of saade-saati can wear blue Sapphire (Neelam). The main source of Blue Sapphire is Ceylon mines in Sri Lanka , Kashmir (Jammu) mines and Burma (Myanmar) mines. Product Description Gemstone Name : Natural blue sapphire Number of Pieces: 1 Pc Weight: 1.19 ct Gem Shape: Oval mix .. Product Description Gemstone Name : Natural blue sapphire Number of Pieces: 1 Pc Weight: 1.23 ct Gem Shape: Oval cut mix.. Product Description Gemstone Name : Natural blue sapphire Number of Pieces: 1 Pc Weight: 1.26 ct Gem Shape: Oval mix .. Product Description Gemstone Name : Natural blue sapphire Number of Pieces: 1 Pc Weight: 1.39 ct Gem Shape: Oval mix .. Product Description Gemstone Name : Natural blue sapphire Number of Pieces: 1 Pc Weight: 1.40 ct Gem Shape: Oval mix .. Product Description Gemstone Name : Natural blue sapphire Number of Pieces: 1 Pc Weight: 1.43 ct Gem Shape: Oval mix .. Product Description Gemstone Name : Natural blue sapphire Number of Pieces: 1 Pc Weight: 1.49 ct Gem Shape: Oval mix .. Product Description Gemstone Name : Natural blue sapphire Number of Pieces: 1 Pc Weight: 1.50 ct Gem Shape: Oval mix .. Product Description Gemstone Name : Natural blue sapphire Number of Pieces: 1 Pc Weight: 1.53 ct Gem Shape: Oval mix .. Product Description Gemstone Name : Natural blue sapphire Number of Pieces: 1 Pc Weight: 1.56 ct Gem Shape: Oval mix .. Product Description Gemstone Name : Natural blue sapphire Number of Pieces: 1 Pc Weight: 1.58 ct Gem Shape: Oval cut mix.. Product Description Gemstone Name : Natural blue sapphire Number of Pieces: 1 Pc Weight: 1.60 ct Gem Shape: Oval mix .. Product Description Gemstone Name : Natural blue sapphire Number of Pieces: 1 Pc Weight: 1.61 ct Gem Shape: Oval mix .. Product Description Gemstone Name : Natural blue sapphire Number of Pieces: 1 Pc Weight: 1.62 ct Gem Shape: Oval mix .. Product Description Gemstone Name : Natural blue sapphire Number of Pieces: 1 Pc Weight: 1.63 ct Gem Shape: Oval mix .. Product Description Gemstone Name : Natural blue sapphire Number of Pieces: 1 Pc Weight: 1.71 ct Gem Shape: Oval mix .. Product Description Gemstone Name : Natural blue sapphire Number of Pieces: 1 Pc Weight: 1.75 ct Gem Shape: Oval mix .. Product Description Gemstone Name : Natural blue sapphire Number of Pieces: 1 Pc Weight: 1.78 ct Gem Shape: .. Product Description Gemstone Name : Natural blue sapphire Number of Pieces: 1 Pc Weight: 1.81 ct Gem Shape: Oval mix .. Product Description Gemstone Name : Natural blue sapphire Number of Pieces: 1 Pc Weight: 1.84 ct Gem Shape: Oval mix .. Product Description Gemstone Name : Natural blue sapphire Number of Pieces: 1 Pc Weight: 1.86 ct Gem Shape: Oval mix .. Product Description Gemstone Name : Natural blue sapphire(khooni neelam) Number of Pieces: 1 Pc Weight: 1.91 ct Gem Shape: &nb.. Product Description Gemstone Name : Natural blue sapphire Number of Pieces: 1 Pc Weight: 1.92 ct Gem Shape: .. Product Description Gemstone Name : Natural blue sapphire Number of Pieces: 1 Pc Weight: 1.92 ct Gem Shape: Oval mix .. Product Description Gemstone Name : Natural blue sapphire Number of Pieces: 1 Pc Weight: 1.93 ct Gem Shape: Cushion mix .. Product Description Gemstone Name : Natural blue sapphire Number of Pieces: 1 Pc Weight: 1.94 ct Gem Shape: rectangle mi.. Product Description Gemstone Name : Natural blue sapphire Number of Pieces: 1 Pc Weight: 1.98 ct Gem Shape: .. Product Description Gemstone Name : Natural blue sapphire Number of Pieces: 1 Pc Weight: 2.00 ct Gem Shape: Cushion cut .. Product Description Gemstone Name : Natural blue sapphire Number of Pieces: 1 Pc Weight: 2.01 ct Gem Shape: Cushion cut .. Product Description Gemstone Name : Natural blue sapphire Number of Pieces: 1 Pc Weight: 2.06 ct Gem Shape: Oval cut mix.. Product Description Gemstone Name : Natural blue sapphire Number of Pieces: 1 Pc Weight: 2.07 ct Gem Shape: Oval cut mix.. Product Description Gemstone Name : Natural blue sapphire Number of Pieces: 1 Pc Weight: 2.09 ct Gem Shape: Square emera.. Product Description Gemstone Name : Natural blue sapphire Number of Pieces: 1 Pc Weight: 2.11 ct Gem Shape: Oval mix .. Product Description Gemstone Name : Natural blue sapphire Number of Pieces: 1 Pc Weight: 2.13 ct Gem Shape: Oval cut mix.. Product Description Gemstone Name : Natural blue sapphire Number of Pieces: 1 Pc Weight: 2.14 ct Gem Shape: Oval mix .. Product Description Gemstone Name : Natural Purple sapphire Number of Pieces: 1 Pc Weight: 2.15 ct Gem Shape: Oval mix .. Product Description Gemstone Name : Natural Purple sapphire Number of Pieces: 1 Pc Weight: 2.16 ct Gem Shape: oval Round.. Product Description Gemstone Name : Natural blue sapphire(khooni neelam) Number of Pieces: 1 Pc Weight: 2.19 ct Gem Shape: &nb.. Product Description Gemstone Name : Natural blue sapphire Number of Pieces: 1 Pc Weight: 2.40 ct Gem Shape: Oval mix .. Product Description Gemstone Name : Natural blue sapphire Number of Pieces: 1 Pc Weight: 2.58 ct Gem Shape: Emerald cut .. Product Description Gemstone Name : Natural Pitambari Sapphire Number of Pieces: 1 Pc Weight: 2.59 ct Gem Shape: &.. Product Description Gemstone Name : Natural blue sapphire Number of Pieces: 1 Pc Weight: 2.69 ct Gem Shape: .. Product Description Gemstone Name : Natural blue sapphire Number of Pieces: 1 Pc Weight: 2.83 ct Gem Shape: .. Product Description Gemstone Name : Natural Purple sapphire Number of Pieces: 1 Pc Weight: 2.92 ct Gem Shape: Oval mix .. Product Description Gemstone Name : Natural Yellow Sapphire Number of Pieces: 1 Pc Weight: 2.93 ct Gem Shape: &nbs.. Product Description Gemstone Name : Natural blue sapphire Number of Pieces: 1 Pc Weight: 2.97 ct Gem Shape: .. Product Description Gemstone Name : Natural blue sapphire Number of Pieces: 1 Pc Weight: 3.03 ct Gem Shape: .. Product Description Gemstone Name : Natural blue sapphire Number of Pieces: 1 Pc Weight: 3.03 ct Gem Shape: Oval cut mix.. Product Description Gemstone Name : Natural blue sapphire Number of Pieces: 1 Pc Weight: 3.08 ct Gem Shape: Oval mix .. Product Description Gemstone Name : Natural blue sapphire Number of Pieces: 1 Pc Weight: 3.10 ct Gem Shape: Cushion mix .. Product Description Gemstone Name : Natural blue sapphire certificate will not be provided for gems value below 10000 rs bcz of low gem value Number of Pieces: 1 .. Product Description Gemstone Name : Natural blue sapphire Number of Pieces: 1 Pc Weight: 3.18 ct Gem Shape: Oval mix .. Product Description Gemstone Name : Natural blue sapphire Number of Pieces: 1 Pc Weight: 3.25 ct Gem Shape: Oval cut mix.. Product Description Gemstone Name : Natural blue sapphire Number of Pieces: 1 Pc Weight: 3.42 ct Gem Shape: .. Product Description Gemstone Name : Natural blue sapphire Number of Pieces: 1 Pc Weight: 3.46 ct Gem Shape: Oval mix .. Product Description Gemstone Name : Natural blue sapphire Number of Pieces: 1 Pc Weight: 3.47 ct Gem Shape: .. Product Description Gemstone Name : Natural blue sapphire Number of Pieces: 1 Pc Weight: 3.53 ct Gem Shape: .. Product Description Gemstone Name : Natural blue sapphire Number of Pieces: 1 Pc Weight: 3.57 ct Gem Shape: .. Product Description Gemstone Name : Natural Purple sapphire Number of Pieces: 1 Pc Weight: 3.67 ct Gem Shape: Oval mix .. Product Description Gemstone Name : Natural blue sapphire Number of Pieces: 1 Pc Weight: 3.73 ct Gem Shape: Cushion rect.. Product Description Gemstone Name : Natural blue sapphire certificate will not be provided for gems value below 10000 rs bcz of low gem value Number of Pieces: 1 Pc..